They’re books—only changed. Carved, warped, fired like pottery, they are books transformed into visual art, but still they’re books. Book art is intimate, fascinating, and transgressive. When we talk about books, we are usually talking about what’s inside, but there is a lot more to a book than reading it. Book art makes those other aspects its domain: the way books look; the way that, with their bent spines and marginalia, they record the history of our own reading lives; the way that these mass-produced objects can seem to hold not just letters but knowledge. 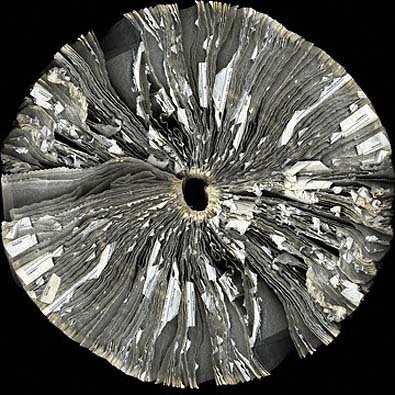 Recently, I spoke with Robert The, Cara Barer, and Jacqueline Rush Lee, three artists that use books in their art. Their approaches vary widely, but each manages to question and change the way we construe books. To continue, keep reading, or jump to each artist’s section: Robert The, Cara Barer, Jacqueline Rush Lee. Robert The never intended to be an artist. As an undergraduate at the University of Wisconsin, Madison, he double majored in Philosophy and Math and was interested in language and logic, pursuing what he calls the “foundations of truth and meaning.” You might say his artwork continues that same search—but in a skewed way. Books are guns, a dictionary is a noose, and bugs crawl out of covers. They seem to mean something, but what? At the very moment that these works create new significations, the meanings float ever-elusively away. I kinda blew a fuse in my senior year—something very strange happened—and I lost my ability to read of a period for a month or two. This sharpened my interest regarding what was actually going on with the symbols that convey meaning on a concrete level. It also unsettled my nerves and undermined my passion to continue with my studies in that particular direction. In the aftermath, The left school and spent a few years drifting. He became intrigued by the formation of letters, first exploring calligraphy and then sign-painting. At Chicago’s now-defunct Institute of Lettering and Design he studied the craft of hand-lettered commercial signs (which were soon to be replaced by vinyl lettering). There, he learned how to work with enamel, a viscous, sticky paint. “It is very different from anything most folks have worked with. Very, very unforgiving and messy. It requires a whole different technique,” he says. One day, The decided to cut THIS into a book. He had never done anything of the kind, and it took him until 1992 to actually realize the work. By then he was living in the Lower East Side of Manhattan and found many discarded books in the trash. (“I always found that painful. I still find that painful.”) He made several THIS books and took them to a SoHo gallery, where, to his surprise, he sold them. Within a year, his work was in major collections nationwide. Robert The’s art remains grounded in his self-described trials with language. Judging by his pieces, the trials can be unsettling: looking at his works is like looking at language itself, the form of letters before and aside from any meaning. These works seem to elongate that infinitesimal moment between focusing on the word and reading it. The pieces involving THIS were the first stage of The’s book art. From there he moved into book guns through a spontaneous gesture. As a work of conceptual art, he had carved the letters REAL out of wood and declared that it was the standard REAL, akin to the standard measurements in the Bureau International des Poids et Mesures. He then took it to an alternative community in Wisconsin, where he wandered into a workshop and decided to carve a new standard REAL from books. He started with the easiest letter, L, and when a local boy came in to play, he picked up the L and pretended it was a gun. That unconscious appropriation became the prototype for a whole series of book guns. A few years ago someone brought me a strange gift, purchased at MoMA’s downtown design store: a copy of my own first novel, Gun, with Occasional Music, expertly cut into the contours of a pistol. . . . I regard my first book as an old friend. . . . Now my old friend had come home in a new form, one I was unlikely to have imagined for it myself. The gun-book wasn’t readable, exactly, but I couldn’t take offense at that. The fertile spirit of stray connection this appropriated object conveyed back to me—the strange beauty of its second use—was a reward for being a published writer I could never have fathomed in advance. There is something fascinating about book guns, which usually make some play on the title or the cover image. In Lethem’s sculpture, there is a repeated displacement of meaning: the word gun, the shape of a gun, and the concept of a gun are all present but unable to coalesce. 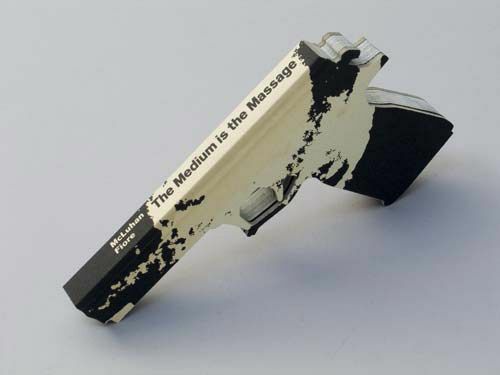 For a different piece, The carved a gun from Marshall McLuhan’s The Medium Is the Massage. It reinforces McLuhan’s theory that technology shapes our understanding by making the book’s contents literally unreadable, but also offers up a paranoic critique of McLuhan’s mediated society. Or picture a hardcover black book, dust jacket removed, with gold lettering stamped on the spine that reads: The Art Crisis. Art is a weapon, but is that the cause or the result of the “art crisis”? 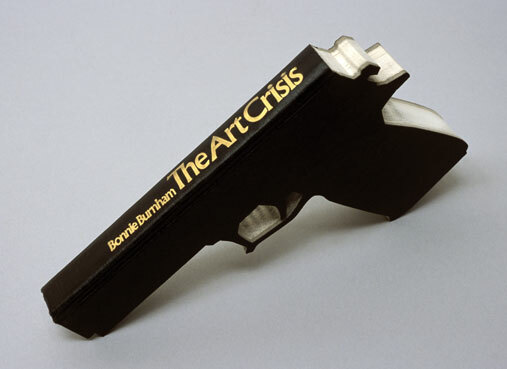 Or is art criticism itself the weapon, ready to shoot down true art? For his own part, The says of his book guns, somewhat deprecatingly, “It’s a permanent one-liner that can be applied to a lot of things,” but this is not exactly true. Clever, yes, but the book guns cannot be reduced to cleverness; like jokes, they cannot be completely dissected, they only function by inverting and contradicting their own internal logic. Book guns are a commentary on language, but they also developed out of a game and can still be picked up and played with. For The, at least, that is part of the appeal. The project was in part in response to works of folk art that The discovered in a Mexican crafts store in the Lower East Side of Manhattan. The crafts reminded The that most people in history have no presence in the “art world,” and that these figures, beautiful and pregnant with meaning, were being sold as toys. It made him want to make toys, too; not high art but objects that people could touch. Despite receiving considerable renown, The regards himself as something as an outsider in the art world. Rather than sell to galleries, he typically sells through retail stores and he is better known in the design community than the art community. (This is fine by The, who says, “You can’t take yourself too seriously or rely on institutions to validate you.”) He also works in different mediums—in addition to the book sculptures he creates conceptual pieces like an eBay auction for “this present moment,” which sold for $13.21. (According to The, eBay is perfect for conceptual art because it creates a record of what happened.) He moves between artistic communities, not fitting exactly into any of them. His works, too, cross boundaries. They won’t come down on any one side, but disconcertingly engage text and art history in different ways. 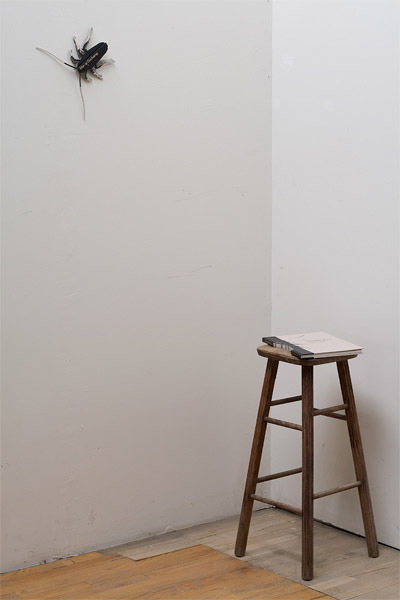 One recent work is a witty reference to Marcel Duchamp’s “readymades”; instead of mounting a bicycle wheel on a stool, The placed a book about Duchamp upon a stool very similar to that used in Duchamp’s famous piece. A small bug, carved from the book’s spine, skitters away up the wall. The book seems to be losing control of itself, spewing forth strange progeny, just as Duchamp’s art spawned unexpected artistic movements. As much as The’s work resembles Duchamp’s readymade, it functions very differently. Duchamp forced his viewers to see the beauty of everyday objects by placing them in a new context. The’s books, however, never lose their prior identity—instead, more layers of identity are added on. We are do not so much re-view the object, the book, as to re-view text, words, and letters, the very possibility of getting meaning from them. We are led to re-view reading. Texas artist Cara Barer‘s epiphany came when she saw a rain-soaked Yellow Pages lying on the ground. She photographed its intricately bent pages and soon moved on to dictionaries, software handbooks—anything with pages might become the basis for her carefully posed, elegantly whimsical images. Barer’s photographs consist almost exclusively of the edges of pages, fantastic arabesques of white or color against a studio portrait–like black background. Pages crinkle, curl and twirl, spines do backbends, the pages of two different volumes touch like delicate tentacles reaching out in a mating dance. 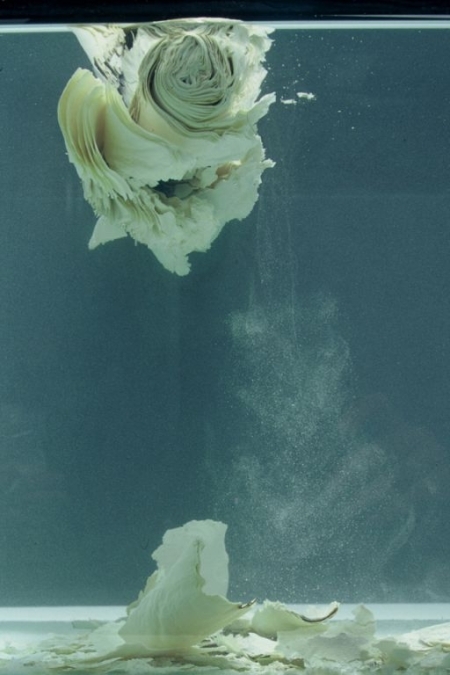 In each work, it is the flexibility of paper itself, stiff, soft, and strong, that we notice. Barer’s book images indicate the infinity of forms a book can take, their form as varied as content. Some works (Butterfly, Whirligig, Snow, Blue Labyrinth) are utter complexes of curlicues. In others, the paper-sprawled pages are transformed into things that hardly resemble books. Coppelia resembles the dense net of a dancer’s tutu and the softer focus Wave and Fog traces delicate undulations of the pages. The books’ content also plays a role in Barer’s creations: “The text can lead me to deviate from the original plan that I might have had in mind. Many times I have started very objectively and ended up reading instead of working on the actual sculpture.” Some titles (Beach Read, New Century, and Roget’s, with its familiar red-tinted fore edges) reference the books’ content, while other images contain isolated fragments of text. The images are large, up to 36 by 36 inches square and almost uniformly photographed before a flat black background. “I want to engage the viewer by presenting the book out of context and cause them to look at it as something else other than a book. With only the object to concentrate on, in its metamorphosed state, it becomes something other than what it is.” Thus, the undulating contours of Fairy Tale suggest fabric or Rapunzel’s long hair as much as pages, and Shitake seems more mushroom gill than paper. On first seeing these fantastic shapes we are caught up in wondering contemplation; their new state seems so self-evident that only later do we notice Barer’s (retrospectively obvious) sculptive interventions. And so Barer continues to search through Half Price Books, abandoned houses, and her own bookstores to transform these unwanted books into exquisite images whose pages we long to reach out and turn. 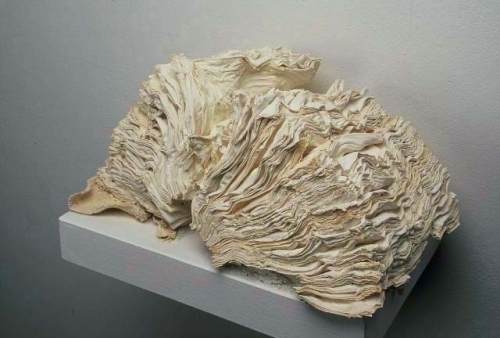 Confronted with Unfurled, a sculpture by Jacqueline Rush Lee, it is difficult to know exactly what we are looking at. Delicate yet durable, its white striations blossom forth like the remains of some heretofore unknown sea creature or perhaps a fossilized fungi. It is neither of these. It is a book, fired in a potter’s kiln at high temperatures until, instead of disintegrating, it reached a brittle, “petrified” state. 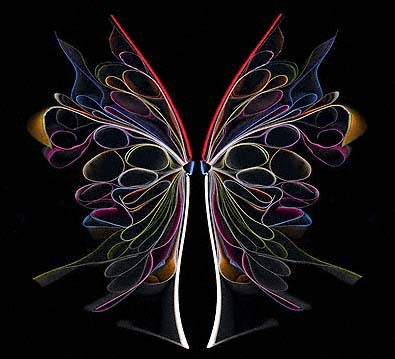 Lee, a Hawaiian artist most known for her book art, uses a variety of experimental techniques to transform books. Lee says she tries to “obscure the nature of the material,” and by hiding the fact that these are books she changes our expectations about what a book is, forcing us to look anew at these volumes that surround us. 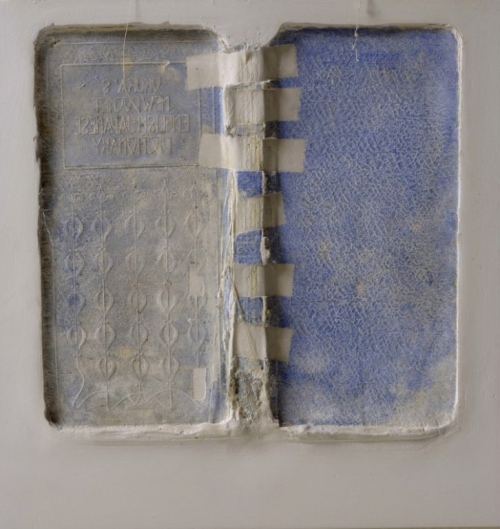 In Unfurled and the other kiln-fired books in her Ex Libris series, the books’ own materiality becomes palpable. Lee seems less to have changed the books than to have uncovered a physical state, as if books, like shells and bones, left behind a calcified framework. We are reminded that books are, in some ways, natural; composed of wood pulp and leather, their condition as books is just one stage in the cycle of creation and decay. In Absolute Depth, another work from Ex Libris, the process is taken one step further: a petrified periodical is placed in a glass tank of water and allowed to decay, “shedding text” in Lee’s words. The disintegrating particles dissolve in the water, changing state but remaining enclosed within the work: a complete ecosystem, a model of transformation. A lifelong book lover, Lee haunts her local Oahu Friends of the Library book sales hunting for intriguing volumes to transform into art. At Kaneohe, her favorite, the books cost 25 cents and the volunteers keep an eye out for the old, worn books that Lee buys in bulk. “They picked up on the fact that I wasn’t the usual book purchaser—that I was buying lots and lots of books for ulterior reasons,” she says. So how does the fact that these are books influence our understanding of the works? Could Lee have used any other object just the same? “Some artists can work with a blank canvas,” she says, “but for me the material or the object has to resonate with me, and that is my canvas.” In these sculptures books are both transmitters of cultural knowledge and common objects that surround us every day. Sometimes they last for a thousand years, other times they fall apart after a few readings, and Lee explores both that frailty and the strength, the passing of time and what is left behind. In addition to Ex Libris Lee has two other book-related series. For Volumes she soaked books then wound the resulting matter into large, wheel-like shapes. Her most recent book series is Epic, which takes the her work in a different direction. Lee imprinted book covers, fore edges, and spines in gypsum cement—essentially making a kind of plaster cast. In the process, the cover dyes bled into the cement. As with Ex Libris, when seeing the works for the first time it is not immediately clear what we are looking at. From a distance, Cloudscape for Anonymous looks like a painting of a sunset with softly modulating billows of pink hovering over the brown line of the spine, but this impression is soon complicated by the fraying threads of the binding and the embossed letters of the book’s title. Lee titled the panels “imprescoes,” a word she coined to describe both the imprint and the fresco-like color transfer. While Ex Libris invokes a recognition of change on a geological scale, Epic is like the fossil record, marking the fleeting, anonymous impact of individual organisms. Lee started this series after the death of her mother and it has an unmistakably elegiac quality. Each panel in the exhibition represents an anonymous book owner, transferring focus from the books themselves to the people who read them. The haunting Ode to Atsuo is an imprint of a Japanese dictionary owned by a man named Atsuo who had carefully taped the cover together. It is an homage to these attempts to delay decay, to the small marks that people leave in the world. I am drawn to the aesthetic of a hand-worn book—say the way that a book has been taped lovingly together, or one that speaks of someone having handled it for a very long time as a precious object. I am also attracted to the marginalia in books and how there is this whole other intimacy and world within books that go beyond the story and the work of the original author. And then, you know, you see that these intimate precious objects are then dumped at a used library space and you wonder about the lives of who these people were who had owned the books. One suspects that Atsuo, who went to such pains to preserve his dictionary, did not give it to the library book sale during his own lifetime. This suggests another aspect of the work. Viewed from a distance, the shape of Ode to Atsuo resembles not just an open book but also a single, fragile, human vertebra. As Marcia Morse pointed out in a 2005 essay for the Contemporary Museum Biennial of Hawaii Artists Exhibition, the spine is “one of several ways in which book structure and human anatomy overlap.” Mortality is very much present in this work, but as epitaph, not tragedy.